Crown Publishing Group (NY), 9780307406101, 342pp. Working under the government's shroud of secrecy, CIA operative Dew Phillips crisscrosses the country trying in vain to capture a live victim. With only decomposing corpses for clues, CDC epidemiologist Margaret Montoya races to analyze the science behind this deadly contagion. She discovers that these killers all have one thing in common they ve been contaminated by a bioengineered parasite, shaped by a complexity far beyond the limits of known science. Meanwhile Perry Dawsey a hulking former football star now resigned to life as a cubicle-bound desk jockey awakens one morning to find several mysterious welts growing on his body. Soon Perry finds himself acting and thinking strangely, hearing voices . . . he is infected. SCOTT SIGLER is the world s most successful podcasting author, with a rabidly loyal following of more than 30,000 subscribers per book. His books have held the number one audiobook position on all the podcast aggregators, including iTunes, and his remarkable triumph has made him the subject of profiles in the "New York Times" and the "Toledo Blade," as well as coverage in the "Washington Post, BusinessWeek," and elsewhere. He lives in San Francisco with his wife, Jody, and their two dogs. You can find him online at scottsigler.com and infectednovel.com." "Sigler has a unique talent for keeping readers on the edge of their seats; I absolutely had to know what was going to happen next. 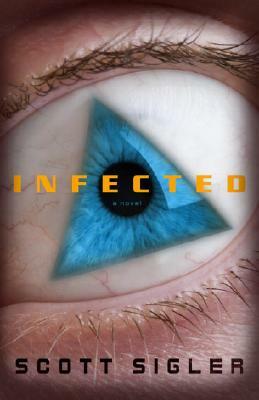 Infected is full of mayhem, action, and gore--and you won’t be able to put it down."